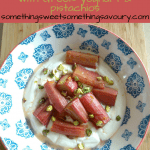 This orange blossom roasted rhubarb with Greek yoghurt and pistachios is a really delicious way to serve rhubarb – in the Winter or Summer! Let’s talk rhubarb. Love it or hate it? My love for it has definitely grown over the past few years. I think it’s Nigella’s fault. Nigella is a massive rhubarb fan and she has a multitude of recipes in her books, especially in How to Eat and How to be a domestic goddess. I made her rhubarb cornmeal cake, not expecting to be particularly wowed by it. Some kind person had given me a small bunch of rhubarb (is it totally weird to say I’d rather be given a bunch of rhubarb than a bunch of flowers?) and I didn’t want it going to waste. Wow, that cake was delicious! It wasn’t very much to look at because the rhubarb wasn’t very pink but the flavour and texture was gorgeous. There’s also one of my all time favourite cakes that the lovely Eat Little Bird introduced me to – the divine rhubarb and custard cake. If you can find really pink stalks, it turns out visually stunning. Recently I’ve discovered the joys of roasted rhubarb. It’s so simple and can be used in so many ways – over ice cream, spooned over shortbread biscuits, stirred into double cream to make a fool or on top of a pavlova – lots of possibilities. I love it for breakfast with Greek Yoghurt and a sprinkling of pistachios – or try it with a nutty crumble sprinkled over the top. Gorgeous and healthy! Preheat the oven to 200C. Spread the rhubarb out on a large ovenproof dish. Zest the orange over the rhubarb and squeeze over the juice along with 2 tbsp of water, finally sprinkle over the vanilla sugar. Stir gently until all the rhubarb is coated in sugar and orange zest. Cover the dish with foil and bake for 20-25 minutes or until the rhubarb is tender but not mushy. If you pierce a piece with a tip of a sharp knife, it should give easily but still hold its shape. Using a slotted spoon, lift the rhubarb out of the dish. Transfer the juices from the dish into a small pan, bring to the boil and simmer until syrupy. Remove from the heat and leave to cool for 10 minutes. This rhubarb is beautiful served warm or cold, with Greek Yoghurt, the orangey syrup and a sprinkling of chopped pistachios. I’m sharing this post over at the monthly blogging event “Breakfast club” which is being hosted by Andrea over at Made with pink and Sarah at Maison Cupcake – both fabulous blogs so go grab a cuppa and check them out! 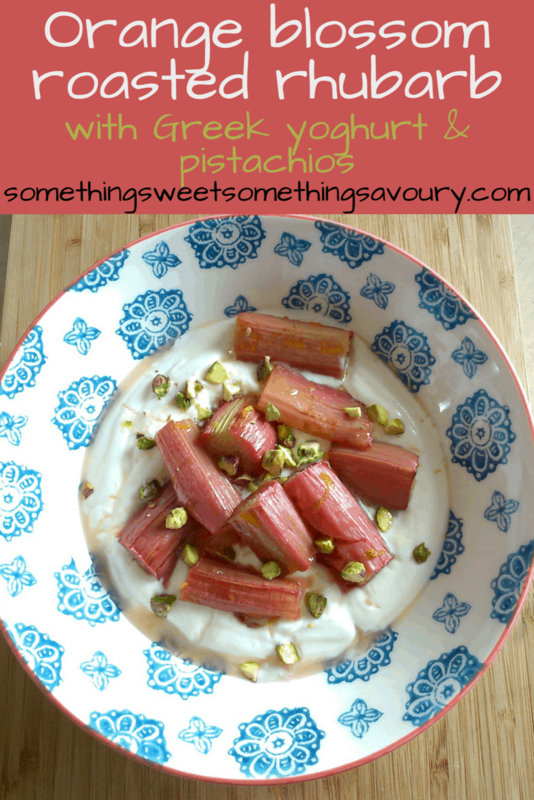 Thanks so much for linking up your Orange blossom roasted rhubarb. This sounds utterly delicious! What a unique combination, and so nice for a summer morning. You’re very welcome – thank you! This sounds delicious. I love rhubarb and orange together but never thought to try orange flower water, even though i have a bottle in the fridge.